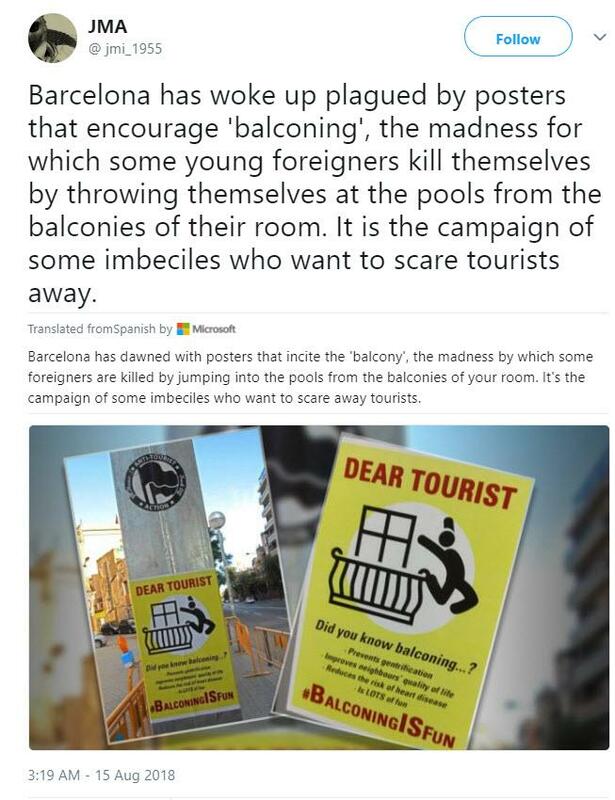 Posters in Barcelona calling on British tourists to throw themselves off balconies because it “improves neighbors’ quality of life” have sparked outcry on social media. Several Britons fell to their death in Spain this year. “Balconing” is the practice of falling from a height when climbing between balconies or, if in a hotel, lunging into a pool from a balcony. As RT reports, the black-humor posters are believed to have been put up by a group of campaigners claiming that excessive tourism in the city is driving up rental prices and driving out local businesses. Most posters reportedly appeared in the popular tourist spot of Vallcarca, near Park Guell, which features work by the architect Antoni Gaudi. It comes after a string of British tourists were injured or killed in Spain this year as a result of balcony- or walkway-related accidents. Thomas Channon, 18, from Rhoose near Barry, Vale of Glamorga, died in July after falling 70ft from a balcony in Magaluf. He became the third person to fall at the Eden Rox apartment complex since April. He was preceded by 20-year-old Tom Hughes, who died a month earlier after falling 65ft from a walkway. And just two months before that, Scottish teenager Natalie Cormack fell to her death from the seventh floor as she climbed from one balcony to another.